Gather your friends and take a winter break in Killarney! Experience the best attractions in southern Ireland without the crowds — with plenty of time to take in the lively pubs, shops, and postcard-perfect winter scenery. With just 24 guests, this smaller guided vacation allows you to maximize your vacation days with a memorable getaway. Enjoy an Irish coffee at Moriarty’s, on your way to Kenmare. Become a distiller’s apprentice in an interactive experience, where you will learn about the history of Irish whiskey, while tasting the delicious spirit. All prices are per person sharing. Single Supplements apply. Your guide will welcome you at Shannon Airport and drive you to nearby Bunratty Castle Hotel to enjoy tea and scones before your tour begins at 10:00 AM. 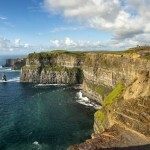 Drive along the coast of County Clare to see the spectacular Cliffs of Moher. 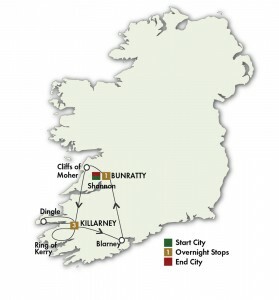 Ferry across the River Shannon Estuary and continue to the charming town of Killarney to explore on your own. Join your group for a welcome drink followed by dinner in the hotel restaurant. Enjoy an Irish coffee at Moriarty’s before heading to Kenmare to browse around and have lunch. 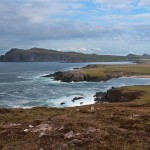 Travel along part of the scenic Ring of Kerry, with plenty of stops to take photos and views. Back in Killarney you’ll become a Distiller’s Apprentice in a unique Irish whiskey experience and enjoy a sample of the finished product. The evening is free to explore and dine on your own. 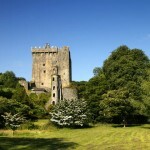 Visit Blarney Castle to kiss the famous “Stone of Eloquence” or walk the lovely grounds. Treat yourself to quality Irish made goods at Blarney Woollen Mills. Journey through the rugged countryside to the quaint village of Bunratty to explore on your own. Enjoy dinner at Durty Nelly’s, one of Ireland’s landmark pubs.